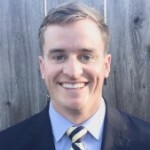 Mike grew up in Milton, Massachusetts and graduated the Naval Academy in 2011 with a Bachelor of Science in International Relations and Chinese. He served in the Marine Corps as an Intelligence Officer for 5 years at Camp Pendleton, including a deployment in 2013 leading a small team in Helmand Province, Afghanistan. He will be attending Harvard Business School with the Class of 2018.